Duncan Beedie is an expert in wiriting books that will help children empathise with characters who are facing challenges. In 'The Last Chip', it tells the story of a pigeon who is hungry and cannot find food until a homeless person gives away their last chip. It's s story about even when you don't have much, there is often someone worse off who needs our help. It's about looking around you and spotting the pigeon who is hungry. It's about not hoarding. It's simply about sharing. In 'The Lumberjack's Beard', the Lumberjack is so busy chopping down trees that he doesn't notice the animals going homeless as he destroys their homes. But when the come to him and explain their plight he offers them a home in his beard and he begins to replant the trees. In ' The Bear Who Stared', Bear isn't very good at making friends. He doesn't know what to say and he just stares at people making them uncomfortable. But with the help of a little frog he learns to share his lovely smile as he meets new people, breaking the ice, and giving him time to formulate his thoughts to say hello. This is such a great story that shows us the importance of a smile. In all three books Duncan's illustrations are witty and characters expressive which for younger readers will help build their empathy as they learn to recognise and read facial expressions. 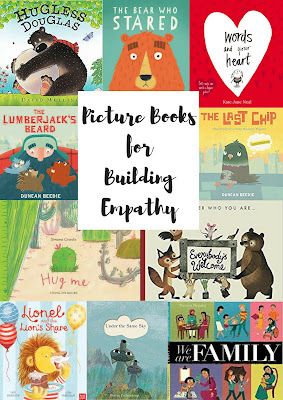 Any of these books would be a great choice for reading to build empathy. And of course, they are just great stories. Every child should be able to see themselves in the pages of the books they read. And every book should show children that they are part of the world around them. Featuring illustrations of families of all shapes, colours and sizes, this book shows the many different families that exist in our society. Not so much a story book, more an illustrated poem about love, family and diversity it is a beautiful reflection of modern society. Seeing ourselves as part of a wider society is a perfect way to build empathy in children and help them to recognise that all our experiences are unique. I did a full review on this book over a year ago but you can find the old post here. Lionel was a lion who did not share. And whenever he sees something he wants he simply takes it: "I am a lion and I get the lion's share" he roars, much to the disappointment of the other creatures. When they finally confront him about his selfish behaviour he storms off in a huff soon to realise that if he continues the way he is he will not have any friends and he makes things up again by surprising his friends. This is a lovely story about sharing, kindness and not taking our friends for granted. The illustrations are lovely and if you enjoy listening to your favourite books on audiobook you can download this one for free from the Nosy Crow podcast or using the QR code inside the book. This book is a very simple but powerful narrative about how your words (and others' words) can affect your heart. The book then tells you all the wonderful things that words can do such as: describing things, explaining stuff, make you happy, make you cry (even pierce someone's heart). Because your words have power! Isn't this so empowering for children? Especially ones like BookBairn who are just learning to speak and finding their own voice. The illustrations are very simple with only a black and red colour palette against a white page. Again this plays to the fact that this book is about the words being important. This book is perfect for helping children see how their words affect others. You can read an old blog post about this one too if you want to find out more! Douglas just wants to find a hug. Pure and simple. This is a funny tale for very little ones about feeling lonely and just needing a cuddle from a loved one. The illustrations are adorable and by the end you'll just want to give Douglas a hug too! In a similar way to the book I mentioned previously, this is a story about just needing a hug. Felipe is a little cactus who comes from a very prim and proper family who firmly believe that you should never trespass into another's personal space. But Felipe thinks they are worried about all the wrong things and they don't notice that he just needs a hug. He sets off on an adventure to find one. This is a story about recognising other's needs. And the illustrations are so adorable too and little Felipe has certainly made me want to hug a cactus which lets face it, isn't exactly the most appealing thing to do with all their spikes and prickles. Accompanied by beautiful illustrations that BookBairn loves to pore over, spotting all her favourite creatures, this magical book really teaches little ones about acceptance, generosity and to empathise with others. We all live under the same sky and we experience many of the same hopes and dreams and emotions wherever we are. We feel the same love. We face the same storms. In this beautiful lyrical text, Britta Teckentrup celebrates and cherishes all that we have and share. Despite different colours, environments and experiences as depicted in her stunning illustrations of animal families all around the world. This is a magical story that will help you feel close as you read together and should help your little one develop their empathy skills. I hope you have found something useful in this list for your children and that you add some great empathy building books to your library. 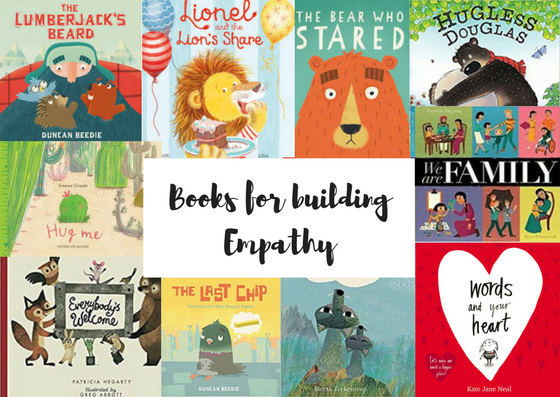 We will continually add to our collection of empathy building books so please do let us know of any good ones you discover! "Read stories. Build empathy. Make a better world." DISCLAIMER These are a mix of books that we have bought or been given by publishers for review - many of them we have now had for several years and I cannot be certain which we bought ourselves and which we were sent. But they all remain on our bookshelves because they are wonderful books! Words and opinions are as always my own. A great set of books for BookBairn and the Wee Page Turner to learn to empathise with others in a nice, gentle, children-friendly way.